When dyeing hair there are a number of things to keep in mind so you get the results you want. This guide is about coloring hair at home. I tie a plastic bag around my hair instead of using a shower cap when I dye my hair. Since bags are free, I don't buy shower caps anymore to let my hair set for 20 minutes when the dye is setting. Also using the plastic grocery bags comes in handy when you are on a trip and forgot the shower cap. Just put all your hair on the top of your head, put the bag over it and tie it tight in the bag like we used to tie a scarf over our rollers in the old days. Be creative and use different colors if there is more than one person in the home who will be using them. When done, just pull off, tie shut with all the dye bottles, gloves, and box inside and throw away. No more mess and no more bills for caps. When coloring my hair I usually use an old towel clipped tight around my neck to keep the color from my shirt. I am a retired beautician and have the plastic apron but they get hot. Here is what I came up with that is way more comfortable and saves a towel. Take an old t-shirt, lay it out flat and cut it out like a dickey only longer. I will make my next one the full length of the t-shirt so I can tuck it in the waist of my pants when I go to wash the color out. This one I had to clip to my shirt which worked OK.
Slit the 'dickey' up the back so you can overlap the two edges to adjust to your neck. Place a clip on your shoulder out of the way. Much more comfortable than that tight clip at your neck or that plastic band and you can throw it away or wash it reuse. Of course you want to cut up the rest of the t-shirt for rags, lint free dust rags. The sleeve fits tight over a broom for gathering cobwebs. First off, it has been years since I last paid someone to color my hair. I have done my own and saved money doing it. But, I needed a way to remind me when I last colored my hair. I wear contact lenses and the boxes have a space to write when you have begun wearing new lenses. I decided to put this method to use with my hair coloring. 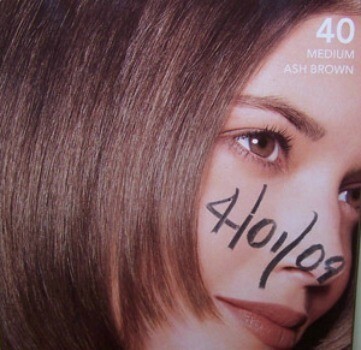 I now write the date I colored my hair on the box front. All I have to do is look in the bathroom cabinet and see whether it is too soon to refresh the color. I wait from 3-4 weeks depending on how fast my hair grows. See my photo. This works great for me as I always try to keep several boxes on hand since I buy them when I find them on sale. 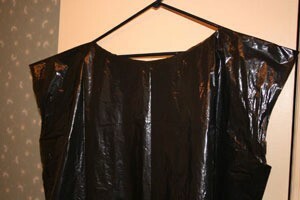 When home coloring your hair, cut a neck hole and arm holes in a large trash bag to protect your clothing. It takes my breath away thinking about how much money we can spend at beauty salons. I stopped going to get my hair dyed years ago. Now I simply buy my own at my local grocery store. I spend a fraction of the amount I used to. I have long hair and after making several messes on the floors, walls and countertops when using home hair color, I have two tips that have helped me to keep things neat. Just got a compliment on my hair color from a professional stylist with whom I shared my use of hydrogen peroxide for highlights and a mixture of red and blonde colored shampoo and conditioner. A friend told me that in order to get my hair the color that I wanted, which was brown that I would have to lift my hair color. So I lifted it and my hair turned blonde. Then I added a brown hair color because that's the color I want. My hair turned a shade of reddish blonde. 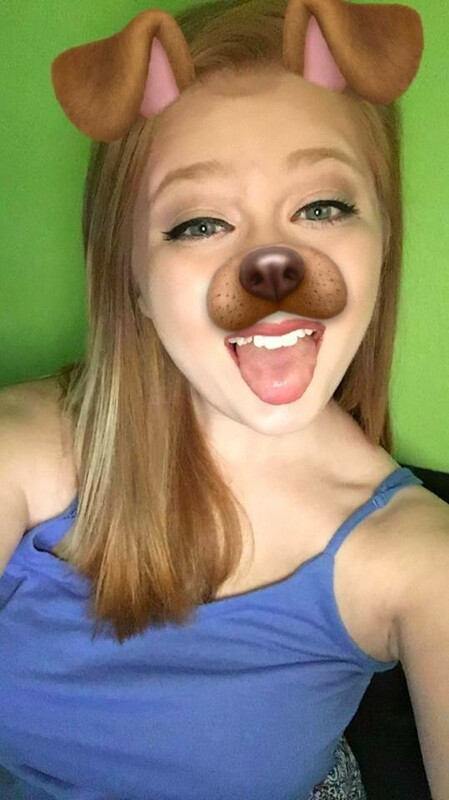 How do I get my hair back to the brown color that I wanted? This red must be lifted off and the brown applied. You also need to condition your hair, since it looks damaged. Do a strand test first so you dont have the wrong color. Your hair is badly damaged now. Before doing much else with your hair you will need to do a lot of conditioning in order to repair the damage that is already done. I would remove the hair dye with with baking soda and a anti-dandruff shampoo. Mix this together and lather up your hair. Leave this in your hair for a few minutes before you rinse it with hot water. Repeat this for a few days to remove the dye from your hair. In between shampooing you will need to apply olive oil or baby oil to your hair at night and sleep with a plastic night cap. You have to repair your hair damage before dying your hair another color. You can also use equal parts of white vinegar and water on your hair. Apply the mixture and cover your hair for 30 minutes. Then rinse with hot water, shampoo and heavy condition your hair. Before attempting to dye your hair again at home go to a salon and talk with an expert. Find out what they will say to you and what is the best way to get the color you want. My hairstylist told me I should always use the same type or brand of hair color on my hair. I've been doing my own hair for years and always got whatever the best deal. It was usually free with coupons and sales. Any suggestions on a brand to stick with? Cost isn't that much of any issue as I am sure I can find whatever brand for a great price. I want to color my hair at home and i noticed on the box it says in BOLD print to apply on dry, unwashed hair. What if there is gel and hair spray in my hair. It's not a lot, but I am thinking that might hinder the color? You are not supposed to wash or brush your hair before you color because it tears up the scalp, and the color is then more likely to cause a rash or bad reaction. It is best if you wash it the night before then color in the morning if that is possible. I never wash my hair before I color it and I use hairspray and mousse both in it. I've never had a problem with it not turning out right. The natural oils on your hair help the dye do its job. Unless you use a lot (and I mean a lot) of gel and hairspray, it won't affect the final results. If your hair is crispy, you should probably brush it beforehand to make it easier to apply the dye. I've been dying my hair at home (except for a few years during the 1990s boom economy when I got it done at a salon) for more than 20 years. You can put the colour over your hair gel and it will work very well because hair colour sticks better to slightly dirty hair. I have been doing my hair for 20 years, so I know for sure it works. You aren't supposed to wash it beforehand because it washes the oils necessary for the colour to stick well. Also, the colour is supposed to be like a shampoo for your hair and then you condition it afterwards. Well, most people here agree not to wash your hair first. Maybe you shouldn't wash it first, but wet it down. When I color my hair I wet it down, wring and comb it out, then apply the dye mixture. I find it spreads into my hair much easier that way and I don't miss anything. I don't have as many tangles to comb out when I'm through and the color always looks fine and lasts. Use your own discretion. Another hint: hair color will adhere more strongly to the ends of your hair because it is more porous. If you don't want your ends to be darker, apply some conditoner to the ends. This will help to even your color out. my stylist always colored my hair if i had hairspray or something in it. my one tip is, if your a dirty blonde, DONT use an ash blonde color. you'll turn green. a nasty looking green at that. i've done both, coloring at home and had it done in the salon. i don't believe the "advantage" to coloring dirty hair is better color reception, i think that's just a sylist convenience. however, structurally, i do believe in the advice my stlylist gave me re getting the most out of deep conditioners may also apply to colorings: she asked me the following question, " which absorbs more moisture quickly: a dry sponge or a wet sponge?" the answer is a wet sponge b/c it's already prepared to accept moisture. so the advice re pre-wetting your hair prior to coloring is sound. also, on the same logic, the advice re pre-conditioning your ends to avoid them over absorbing the coloring is also sound on the same priciple. I had blonde highlights and I dyed my hair dark brown from a box hair dye, but I noticed the day after that where my highlights were blonde it has a dark grey color, how can I fix that? Do I just re-dye it with another brown dye? All hair stylists recommend waiting 4 to 6 weeks before dying your hair again. Otherwise, this can damage your hair. Did you use a permanent or semi permanent dye in your hair.? If you just want to cover up the gray highlights there is no need to dye all your hair again. Buy a permanent hair dye that is the same color as your hair now and a highlight brush. Only dye the gray highlights in your hair. You will need to leave the dye in your hair a bit longer. One reason this turned gray is because when your hair was highlighted it is the same as stripping the color out of your hair to give you these highlights. The color prep worked great and the funny thing about it is that it lifted the piles and piles of red that I've used over the years. Anyway, my hair turned out the exact color I was going to re-color it. Do I have to recolor or can I leave it as is? My hair will not dye and I want it blonde. How can I achieve those results? I have never colored my hair before but I think I would like to. I want to do it at home with a product that is not permanent. I do not want to have dark roots showing. My hair is dark brown with reddish highlights and I would like to make it a little lighter than what it is now. Can anyone suggest a GOOD product that won't dry out and ruin my hair and leave my hair with a good color and in nice condition? I have reached the age where I will need to start coloring my hair. I am considering using "Just for Men". One of the FAQs mentions that gloves are supplied to avoid staining the hands. I am bald on top. 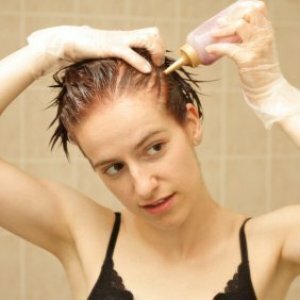 How do I stop the product from staining my scalp? Also, since I have less hair than the average man, can I use the product for two applications? I have emailed "Just for Men" twice without a reply so if anyone can recommend an alternate product I will be glad for the advice. As a woman that has colored my hair for years, I can tell you that it is hard to keep the color stored once you have opened it. With coupons and sales you should be able to get the product for little or nothing. Also, most of your questions should be able to be answered by phone. The product will have an "800" number to call and even get some coupons for the product. I hope this helps! I have baby fine, short hair. I always threw away more hair color solution than I used. Several years ago I got smart. I realized that the hair color solution doesn't "keep" because the two ingredients have been mixed together! Check the two containers in your haircoloring kits. Although the containers are in different shapes they contain the very same amount of liquid! I screw off the caps ( don't snap off or break off any "tips"...just unscrew the container lid or cap). I have a set of plastic (not metal !) measuring spoons and a small glass (not metal!) bowl that I use. I pour out EQUAL amounts from each bottle (measured in my measuring spoons) into the glass bowl and mix with a plastic spoon. For example...use 2 Tbsp. of color and 2 Tbsp. of activator. Tightly cap the remaining products (unmixed and in their original bottles) and use the next time. I can get three uses out of one kit! Just don't use any metal spoons, bowls etc. when doing this as the metal can have a chemical reaction with the solution and who knows what that might do!!! If you've had your hair colored at a salon......... if you can watch.....your hairdresser will pour an amount of "color" into her applicator bottle from a big bottle......and then add another ingredient I'm calling the activator from another big bottle. This is what you'll be doing too, only your "big" bottles are smaller! :>) I might add that I always used hair color for women, not men, but I assume that the ingredients are the same. The marketing technique is just a little different. Any stray haircolor stain on my skin always comes off when wiped with a cotton ball dipped in rubbing alcohol. I just dyed my dark brown hair red the other day with Herbal Essence's Deep Red #44. The results turned out rather purple and not the deep red that i was hoping for. The hair color I want is similar to Julianne Moore's. Could you post some recommended hair dye (brand and color) that would work over my first dye job and give me good results? I colored and conditioned my relaxed hair and all the color came out. What did I do wrong? I used a semi permanent hair color by Clairol and Tresemme conditioner. So recently, about a month ago, I got my hair dip dyed blue. I had to use bleach as my hair is naturally a very dark brown. It has now unfortunately turned a weird ash greeny-grey colour and I really want to put a purple on the end of my hair now. I am wondering what product I should use. Would a colour remover work or would I have to go full on bleach to get it back to a light enough colour to put more colour on? My question is about changing black hair to a variegated color of red, dark brown, and very light brown. I read several postings about lightening hair color. But I am not sure the answers fit my question. Do I need to first bleach the hair and then apply different hair colors? What are the easiest ways to achieve the result? What should I do if I use a box of permanent Dark and Lovely hair dye and it didn't dye my hair correctly? I am naturally a red head and I have been thinking about dyeing my hair. I keep seeing this new trend called opal hair and I'm in love. But my mother says that if I dye my hair it will never grow back to my natural red hair again. She says it happened to my cousin, but I don't know if I should believe her or not. If I dye my hair will it grow back my natural color? 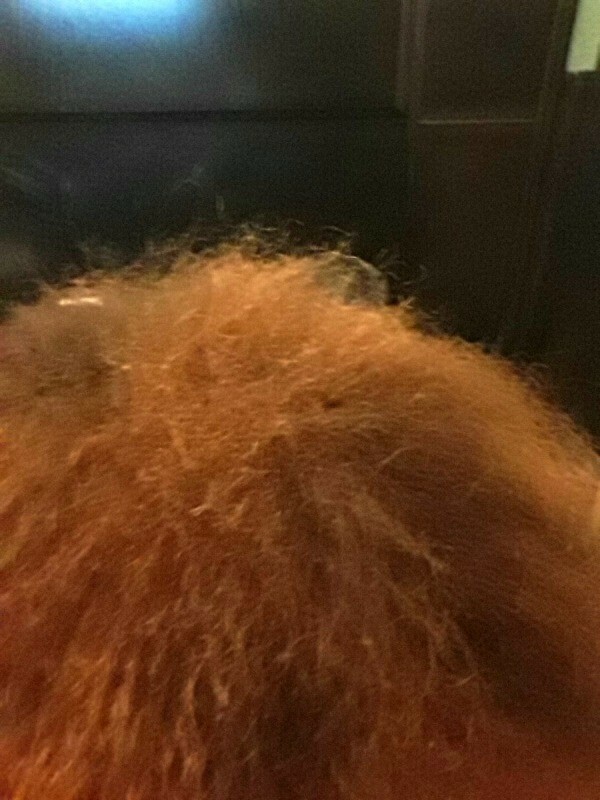 This is a picture of my natural hair, I do have blonde in it from where I bleached it and put purple in my hair just over a year ago. I am looking to color my hair dirty blonde, but I am relatively inexperienced. So if someone could tell me what hair color I should use, what technique, and how I should care for my hair after it, it would be great. Thanks. Back in November I used a semipermanent hair dye to color the ends of my hair dark turquoise. It is now March and my hair has faded to a kind of greenish color. If I purchase more of the semipermanent dye in dark turquoise will that be all I need to get my ends back to the vibrant color that it was before it faded?